A 16th century dwelling house probably oblong in plan and containing three storeys, the lowest of which may have been vaulted. A feature of interest was the south west angle which was borne on a continous corbelling of four members. The round was provided with shot-holes pointing downwards.The masonry is rubble, Four and a half and Four and three quarters Feet thick but, the round and its corbel were of ashlar. 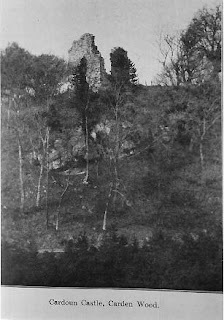 The tower has been thirteen and a half feet wide internally but its length is indeterminate.This ruin stands on a rock overlooking the Gelly Burn in the Den approximately one mile south east of Cardenden Railway Station. Royal Commission Ancient and Historical Monuments Scotland. The estate of Carden first appeared in records associated with the family of Martyne in 1482 when King James 4 confirmed a charter by the deceased John Martyne of Medhope,Linlithgowshire to his son, Henry, of the lands of Cardwan, in the Constabulary of Kinghorn.It remained in that family until the death of Andrew Martyne without issue in 1549. No heir entered into possession for 50 years.In 1582, James 6 granted the lands of Carden to George Mertyne who claimed it through his mother, one of the Duries of that ilk. George Mertyne appears to have been the last of that family in Carden.In 1623 David Wemyss was served heir to his father, Duncan Wemyss, in the lands and Barony of Carden. By 1642, David Betson was successful in a petition to have his Barony of Carden disjoined from the Parish of Kinghorn and adjoined to Auchterderran. In 1707 it was disposed of to the Earl of Melville and in 1725 the estate of Carden became the property of Ferguson of Raith. 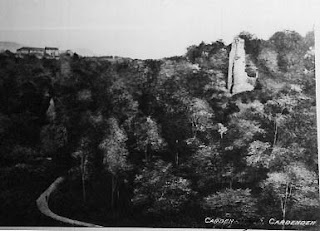 Until 1988 we thought that the earliest record of Carden was in 1482 when James 4 confirmed a charter of John Martyne of Medhope in Linlithgowshire which granted to his son.Henry Martyne, the lands of Cardwan in the Constabulary of Kinghorn. However,having searched all the usual historical sources, we decided to write to Geoffrey Barrow at the Department of Scottish History in Edinburgh.Imagine our excitement when he wrote back saying that he had recently come across a completely unknown charter of William the Lion, dated around 1170, which referred to "my forest of Carden". According to Professor Barrow, it would seem likely that Carden was an area of woodland in the 12th Century which the Kings of Scotland kept for their private hunting. The King would appoint one of his servants as keeper of the forest and, no doubt, he built himself a home there. The obvious site would be the cliff overlooking the Gelly Burn where he could command a good view over the area and defend himself if necessary. The name Carden which means "high fortified place" and the site itself, high up above a ravine, suggest that this may well have been the site of a much earlier fortification. Back in the Middle Ages, the pattern was that keepership of royal lands and forests usually became hereditary. This may have been the case with the Mertynes of Carden. We have certainly found references to them holding the lands of Carden during the 15th and l6th centuries and it must have been this family who built the sturdy sandstone tower-house. By the early l7th century the Mertynes are no longer mentioned and charters refer to the Wemyss family being in possession. By 1642 ownership had changed again and we find David Betson petitioning the Crown "to have his Barony (of Carden) disjoined from the Parish of Kinghorn and adjoined to the Parish of Auchterderran". On the Hearth of 1694 we found that Lady Carden was paying tax for 4 hearths, and in the 1695 Revaluation of the Parish of Auchterderran the estate of Carden was still valued at £1292. However, when we looked up the Register of Sasines for the same period it became clear that the Betsons were in financial difficulties and, not long after, the lands passed into the hands of the Earl of Leven and Melville, from whom Robert Ferguson of Raith purchased it, along with Raith, in 1725. We can be certain that the Tower was still being lived in when the Hearth Tax was paid in 1694, but once the land passed to the Earl of Leven and Melville it is likely that it was abandoned. Certainly by 1725 it was a ruin because in that year Robert Fergusson of Raith prohibited the removal of stones by local people. Thanks to Anne Mead for this contribution. I myself have found (in the Edmonstone MSS at the Historical Manuscripts Commission, 1909) a reference dated 1651 to Sir Archibald Stirling of Carden, Knyght. Also (in the Laing MSS at Edinburgh University) a statement that Sir Archibald Carden, 7th Laird of Keir, died in 1668, and a reference to Lord Carden, Laird of Carden in the Proceedings of the House of Lords for 1709. I have found no other references to Carden in Scotland prior to about 1750. From this I deduce that the family name Carden did not exist in Scotland until Cardens arrived from England in the past two centuries, but that a member of the Stirling family was known as Lord Carden, his title having been taken from the place of that name. There is therefore unlikely to be any truth in the belief of many Cardens in USA that they are descended from a Scottish Carden family.